On the second day I was up at 7:30 and there was no hope of seeing dgym for some time yet so I set about getting the stove set up for our porridge, and foraging for blackberries. Dgym emerged two hours later, still tired from his disturbed sleep. Blackberries and porridge are a lovely combination, or so I thought, dgym decided he wasn't so keen on porridge after all so started considering alternative breakfast solutions. Tuesday was not kind on the legs, and we only ended up riding 15 miles. The few miles to Whitchurch Canonicorum were OK but then were faced with our first arrowed climb (the designation on our map for steep gradients) followed by a similar descent to Wooton Fitzpaine, where we were delighted to find dozens of swallows waiting for us on the overhead phone lines. 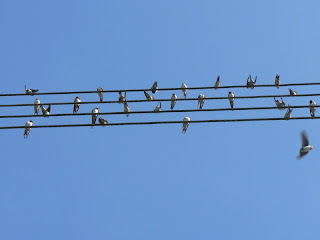 Having recently become rather fond of swallows after moving in next door to a nestful of them, we were quite pleased to see this. A longer and more difficult climb stood between us and Monkton Wyld Cross. At the top we decided that since dgym was hungry and I was thirsty, we should head for Axminster. We hadn't seen much in the way of shops or pubs all morning so this seemed like a good idea. We had fish and chips in Axminster and found a Tesco on the edge of town where we stocked up on water, snacky cakes and some bits for dinner. We reached Colyton a little after three. 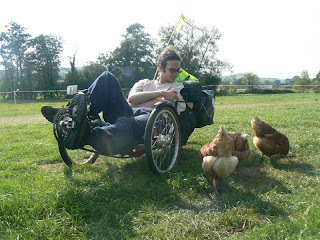 We'd been planning to go a little further but we ran into another C&C site adjacent to a field of cows and free-range chickens, in which the chickens were able to walk under the electric fence and roam the campsite freely - it looked like a fun site so we stopped. I took a wander around Colyton which turned out to be a lovely town with a beautiful church, old buildings and quiet narrow little streets. The chickens were plump and tasty-looking, and very lucky that we already had our dinner planned. They seemed determined to get their pesky little beaks into our food, so dgym herded while I cooked.